Koh Samui real estate market offers numerous reasons to push forward with residential development, particularly in the high end sector. A growing international reputation, a diverse client base and a strong brand investment look are the main advantages for taking your chances with Koh Samui real estates. Because Samui island is one of the most sought after tourist destination in Thailand, the demand for residential properties, especially in the resort area, is influenced by foreign buyers. This market is very sensitive to global factors. As a matter of fact, a considerable part of Koh Samui property is represented by villas owned by those who have visited the island and found a passion for this life style. These tourists have fallen in love with this exotic place, and see the idea of investing in a medium size, but modern and elegant villa as a very appealing opportunity. On one hand they have the excuse of visiting the gorgeous island at any time while enjoying the comfort of their own home, and on the other hand they make an investment that might very well increase its value in time. There are currently over 2.5 million tourists that visit Koh Samui each year. These visitors re-enforce the sales of resort properties while the arrival of high end resorts increase the prices of all real estate properties. There is also a very noticeable change in the tourist’s profile. If until 2000 most visitors were from budget to mid-range, now there are more and more high-end travelers who are searching for luxury accommodations and lavishing amenities. There are currently two different real estate markets in Koh Samui that are showing a high level of interest and activity. There is the luxury end of the market that includes properties which cost over Bt30m and these are preferred by nigh net worth buyers who are less price-sensitive. And there is the low end of the market with properties that cost under Bt9m where mortgage financing is accessible for those who are not Thai residents. Land in Thailand increases its value by day as the island is going through a continuous transformation. The most recent improvements were brought to the airport which is one of the most modern and sophisticated ones in the world. The infrastructure was improved, flights have increased, the quality of the construction is considerably better, new airlines and routes were introduced. This eases very much the access of both visitors and investors to one of the most attractive real estate market in this part of the world. Luxury villas in Koh Samui tend to lead the real estate market. This is a consequence of the fact that tourists seem to prefer a more intimate, comfortable and cheaper alternative to the traditional high end resort. They want to enjoy a private accommodation that is able to provide the same amenities as a classy resort. This is why most projects feature villas that have 3 or 4 bedrooms, infinity pools, spas, modern landscaping, and an elegant architecture. Koh Samui is no longer the destination it was in the 90s as the Island has grown to be a high end destination for those looking for the perfect seaside vacation. Nowadays, Koh Samui is a legendary place to spend your free time, pamper yourself and check out the most amazing beach clubs in Thailand. Even Chaweng Noi, an area that had a lot of budget travelers has become sought out for those looking to get the most amazing vacation homes. Its beautiful sea views and the fact that it is a bit more secluded than other areas in Koh Samui make it a real estate gem. But before buying property in Koh Samui, you will need to make sure that you understand the particular real estate situation there. Also, doing your own research is the best way to make sure that you get all the information you need and that the property you are about to buy meets all your expectation. Some properties have certain characteristics that make them more desirable and these characteristics can be different from country to country. 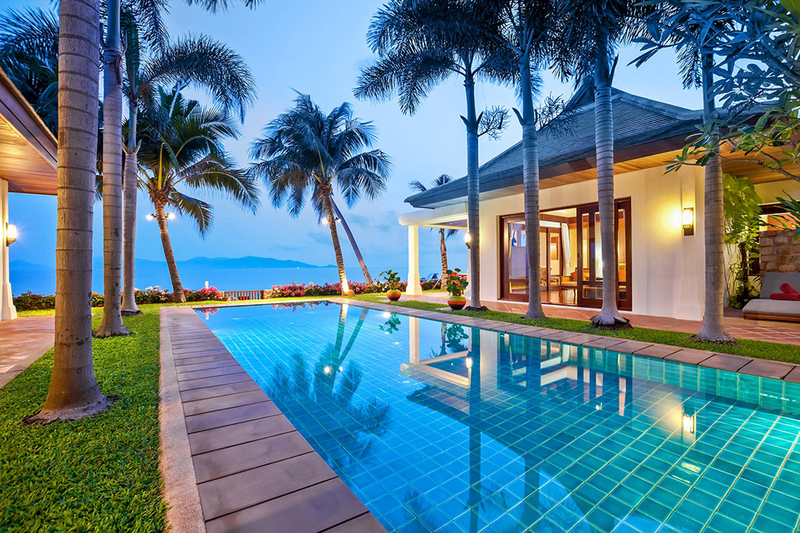 In Koh Samui, properties with a private pool usually have the highest prices. But there are other things that might change the way a property is priced, for example, whether it is a private community or not or whether your property has any communal area with other properties. Another important factor is the view as some properties with a 360 view are a lot more expensive than others with a more limited view. Although it used to be a budget destination Koh Samui now has a lot of investors from Europe and the USA who are looking to buy larger and more expensive properties. Nearby Asian countries like Hong Kong also contribute to its latest development. Due to its unique location and beautiful surroundings, Koh Samui seems to be the dream island where everybody wishes to have a vacation villa. Some even prefer to retire here as there is a great international crowd and high-standard services available for expats. Koh Samui is also an excellent option for those looking to invest in real estate as prices keep rising every year. Those looking to buy property in Thailand should know that it can be extremely difficult for a non-Thai person to obtain funding in Thailand so they should already have the money available or get a loan in their country of residence. A secure funding is essential when trying to buy property anywhere in Thailand, not just Koh Samui. © 2019 Htilt Hotels . All Rights Reserved.